The European part of Russia. 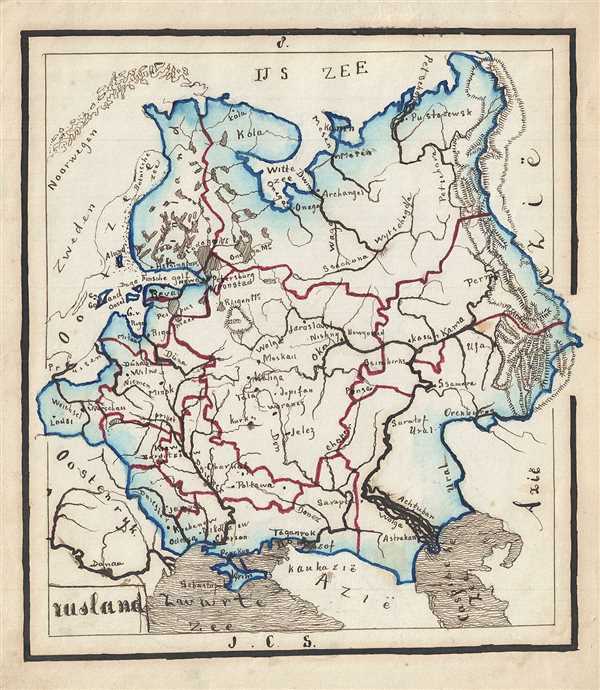 This is a lovely 1871 manuscript map of European Russia by J. C. Sikkel. The hand-drawn map covers Russia at the time when it was under the suzerainty if Tzar Alexander II and extends from the Baltic Sea east to the Ural Mountains and south as far as the Black Sea and the Caspian Sea. Includes Finland. Throughout, the map notes impressive topography and identifies cities, seas, islands, etc. Features wonderful and whimsical overall presentation. This map was drawn in 1871 by J.C. Sikkel as part of Der Atlas Geheele Aarde. Schoolgirl maps began appearing in England and the United States in the later part of the 18th and the early 19th century. These wonderful, fascinating, and often whimsical maps are the product of a radical change in the education of women taking place at this time. Girl's schools, which formally concentrated only on the "womanly arts," began to see a need to education women in such subjects as geography, mathematics, and science. This transition occurred at a period of globalization, prosperity, and colonization. Men were ever more frequently called away from home by the exigencies of war, economy, and the administration of global empires. Women were thus left in control of their lives and finances on the home front. The education system of the period responded to these changes by advancing studies for women in history, geography, and hard sciences. Unfortunately, many of these progressive schools were highly underfunded and lacked proper educational materials such as maps and books. One way of adapting was to learn geography by copying maps and atlases borrowed from other institutions. Schoolgirl maps appear in a variety of formats, including embroidery, painting on cloth, and drawings on paper, ivory, and wood. Many schoolgirl maps are must be considered as much folk art as cartography.